True Giants in Neolithic France: A subject overlooked for 100 years. In my years of amateur study, I have come across internet references to “Meganthropus” and “Gigantopithecus” 8 to 12 foot tall Pleistocene “Ape men”. But these giants have only been based on jaw and teeth (For which I shall address in another post). The best way to calculate height if an entire skeleton is lacking, is from the bones of arm and legs! Fortunately, such bones have occasionally been documented. The giant of Castelnau, reported in the New York Times after rigorous independent analysis by a highly esteemed pathologist from Montpellier School of Medicine. Image of Bones, an engraving on pg. 12 of “La Nature” vol. 18, Issue. 888. June of 1890. 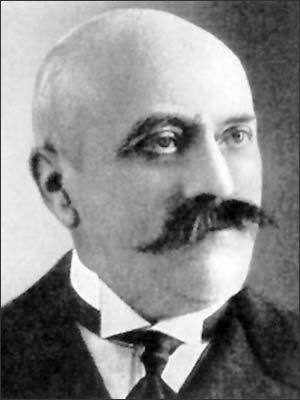 Professor Georges Vacher de Lapouge. Well regarded anthropologist, respected by Madison Grant and even included in Topinard’s journals. His Atheistic, Darwinian, Socialist, Anti-Semitic, Eugenicist views make his discovery of giant bones all the more noteworthy. His calculations indicated the Neolithic giant man was about 3.5 meters tall, and several hundred Kilograms weight; 11 feet 6 in., and 1,000 pounds! 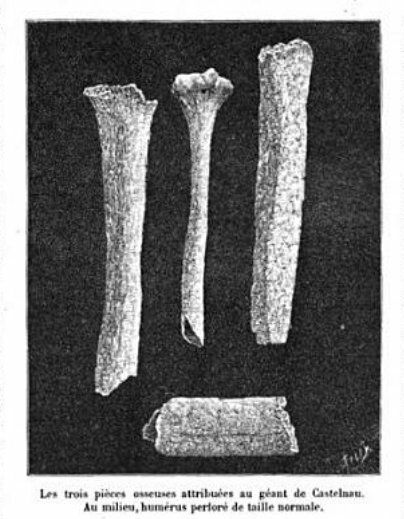 The size of these bones were truly remarkable, as Lapouge writes in La Nature: “The first is the middle part of the shaft of a femur, 14 cm length, almost cylindrical in shape, and the circumference of the bone is 16 cm.” 16 Centimeters is about 80% thicker than a normal 5 ft 9 in tall man’s femur, which generally averages about 8.5 to 9 centimeters in circumference at the middle part of the shaft. 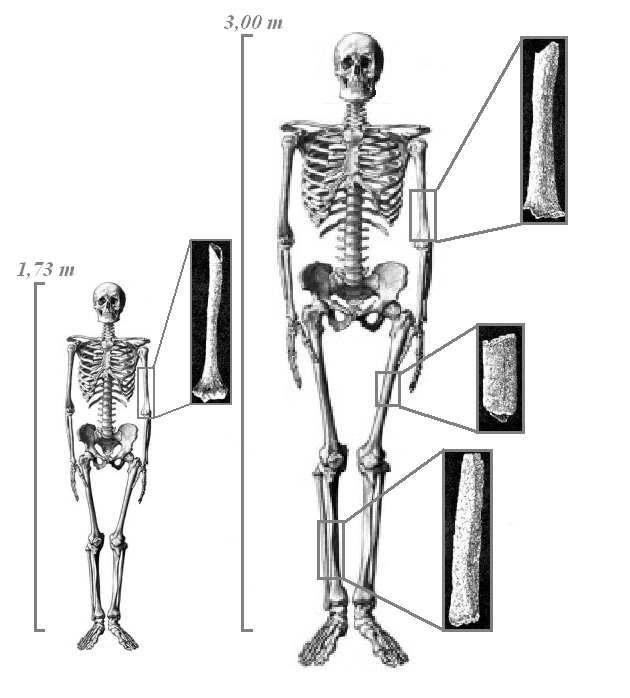 If the giant’s femur were proportionate to its girth, its length would also be about 80% longer, or about 33 inches – 84 cm. My Reocnstruction: The femur of the giant of Castelnau, Right. 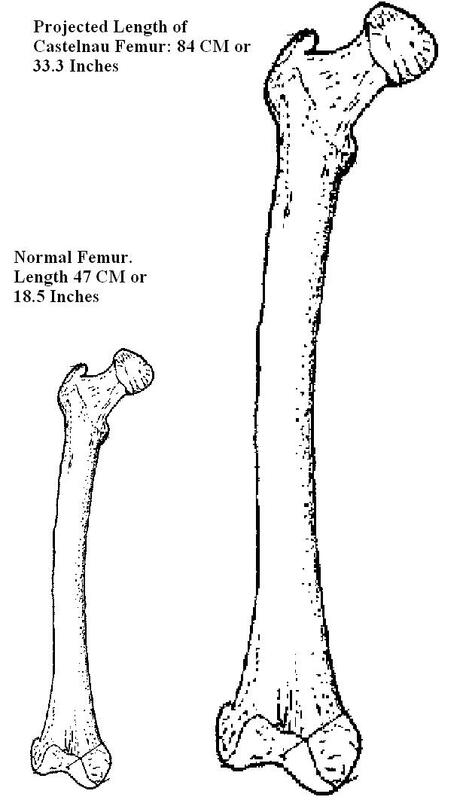 The femur of normal 5 ft 9 inch man, Left. Illustration (I made): The Limb bones of the giant of Castelnau when placed in their proper positions give us the picture of a giant at least 3 meters tall (10 feet). 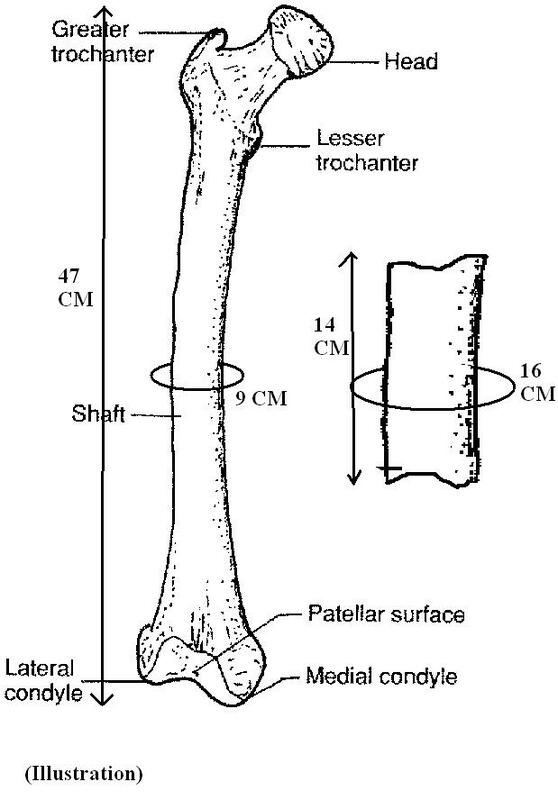 The femur of a normal man generally represents 27 percent of his full skeletally erect stature. We may indeed add 1 to 2 inches to this when we factor in shoes, skin, and hair. The most accurate estimates of height are based on the femur. If the giant’s femur were 33 inches long, we are looking at a skeleton 10 ft 2 inches tall, not including a few more inches of flesh and hair added to this. Taking into account all factors, the giant of Castelnau represents a likely human anomaly of 3 to 3.5 meters tall, between 10 and 11 feet. 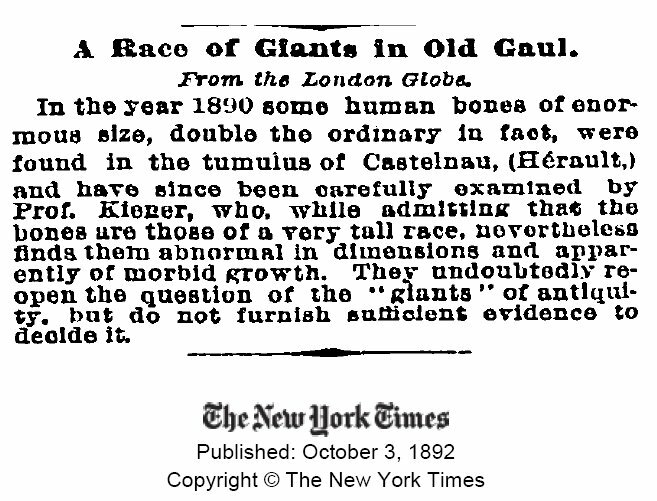 In 1892, Dr. Paul Kiener of the University of Montpellier studied the bones and found them to be abnormal, but apparently of a “very tall race” (see NY Times). This opened up the question of the giants of antiquity, but did not solve the problem of their origins. But was he simply an anomaly? Prof. de Lapouge writes that in the same cemetery at Castelnau he found the base of a skull, lacking the os frontis, from a young man about 18 years of age. He says this skull exceeded all the skulls in dimensions, including the Polynesians. On pg. 11 of “La Nature” he estimated this boy to have been “well over 2 meters” tall — ( 2 meters is 6 ft 7 inches) Thus indicating a boy over seven feet tall. The skull had the morphological characteristics common to the dolmen people of Lozere (who were long headed Aryan types). Lapouge also mentions that several instances of giant bones were indeed reported from Lozere (100 miles North of Castelnau), but that they had been unconfirmed as if his writing. 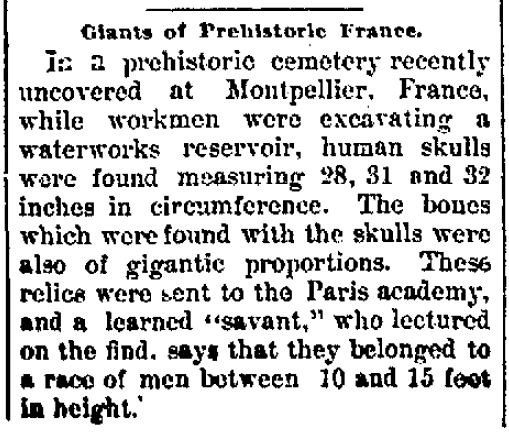 Reports of giant bones at Montpellier tend to re-open the question of the Neolithic giants of southern France. Illustration (I made): The skull of a normal man, 21 inches circumference. 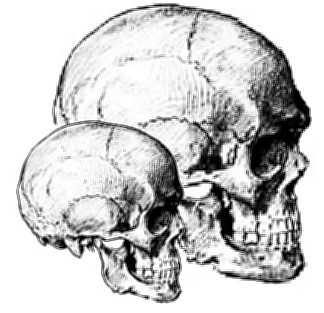 The skull of the Montpellier giant, 32 inches circumference. Such a giant may have had over 3 times the cranial capacity of a normal man. Something like 4,300 cc. The Miami News, Dec. 26, 1918. Skeletons of Seven foot tall Neolithic giants. Freeport Journal Standard, April 15, 1933. Skeleton of Giant 8 feet 7 inches long. The Evening Tribune, Aug. 16, 1935. 13 foot long Skeleton. Reims, France. The Oswego Commercial Times, Aug. 8, 1851. 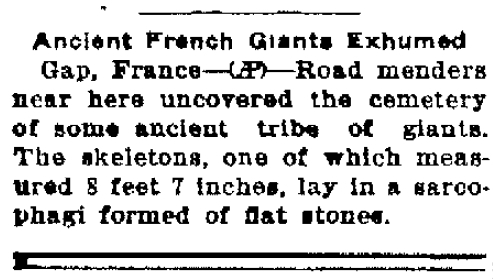 All of these reports, when viewed separately can be explained away as anomalies or press exaggerations and “tall tales.” However, when they are seen in retrospect, and in light of the scientific bone measurements from the Castelnau giant, they may indeed offer strong circumstantial corroboration to a true and physical reality, that some “giants” did indeed inhabit France in ancient and prehistoric times, and in rather substantial populations as opposed to an occasional individual here and there. On the mainland, and particularly in the north, is where more traditional accounts are collected. Giants atavistic, considered pagan by the Christian religion, far from disappearing have survived in folk tales and we have been presented as belonging to a gigantic race, and not as a singularity. In Catalonia “gegants els” are still present in many festivals and performances. Have been integrated into popular festivals to the point that all counties have their own and are part of the cultural and historical heritage. Locate local folk tales linked to numerous giant megaliths, menhirs and dolmens. The megalithic monuments were built (according to folklore) by giant beings overnight. In Portugal, the dolmens are still called Antas (tomb of the giant or construction of the giant), perhaps in honor of the giant Antaeus. In Euskera megalithic monuments are called Mairuen Baratza (orchard or garden giants of the Gentiles, the latter name with which they are known in the Basque Country). Therefore, the universal tradition designates the dolmens and tombs of the giants could pose more of a legend, if you stick to the archaeological evidence. In principle, a controversial site in the remains of these features is the dolmen of Oren, in Prullans, Cerdanya (Catalan Pyrenees). In 1917, it seemed, were discovered, among other pieces, femurs of 70 to 92 cm long. While there is much confusion about the veracity of the finding, the researcher Fernando Ledesma in his book The Cerdanya, emerald Pyrenees Magic ensures that found seven skeletons of the human species in the dolmen I, of great importance. The Dolmen of Oren I. Skeletons of giants were allegedly found here in 1915. The writer and journalist Miguel G. Aracil actually extends nine skeletons were discovered at the time of the Man of Cro.Magnon (when the man of this period did not exceed, as determined by official science, the 165 cm high). These remains were guarded by the Casanovas family at the Tower of Prullans, former mansion of the Marquis of Monistrol. Later, some of these remains were handed over to the Archaeological Museum of Catalonia. Unfortunately here you lose track of this material, because the museum does not recognize ever seeing them. The fact is that arquelólogos and scholars have found relatively often daunting human bones in the Iberian Peninsula. In Garos (Pyrenees of Lleida), to reconstruct the apse of the church, the pastor Mossèn Jaqquet found the remains of a giant three meters high with an iron nail into the skull. In the reconstruction of another church, in Urbasa (mountain system between Alva and Navarre) were found human remains of cyclopean size. Have also been found human skeletons of gigantic dimensions in Castile Medinaceli found near a skull and several bones in Leon, in the Visigothic church Marialba, skeletons of three-meter wingspan, and also in Cantabria, Girona (Besalú). … Practically all the remains are missing today, perhaps a few dozen scattered among collectors of memories. But the crucial question is: why no scientist entertains collect and study all the data, remains and evidence available? I have corresponded by email with Mr. Aracil. He mentions that a Dr. Campillo a forensic anthropologist, has studied the bones of the giant of Prullans and that these measurements are recorded in a book. I am attempting to verify this information. It is likely that this is Dr Domènec Campillo of the Archaeological Museum of Catalonia, and Archaeological Museum of Barcelona. Mr. Aracil says the bones of the Prullans giant are kept at the Museum of Montjuic, Barcelona. 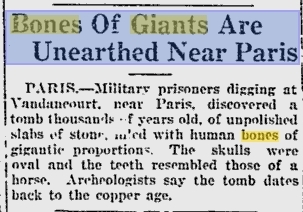 This entry was posted in Uncategorized and tagged Castelnau giant, giant bones, giant humans, giant of castelnau. Bookmark the permalink. Thanks. I’ll update if I can validate any of the giant bones or pumpkin sized crania. It is an intriguing mystery, and I don’t like to be presumptuous, but it seems these sorts of anomalies or oddities have tended to get swept under the rug, or forgotten entirely.